Acupuncture is effective for the treatment of gastric ulcers and chronic atrophic gastritis. Two independent research teams examined these digestive conditions and determined that acupuncture is a safe and effective treatment modality. Let’s take a look at the first investigation. In a controlled laboratory study, Xiamen University researchers determined that acupuncture is an effective treatment modality for the alleviation of gastric ulcers (also known as stomach ulcers) while simultaneously repairing damaged gastric mucosa at lesion sites. The Xiamen University research team (Zhang et al.) identified important biochemical mechanisms elicited by acupuncture responsible for producing the therapeutic benefits. The research team identified biochemical responses elicited by the application of acupuncture for the treatment of gastric ulcers. Gastric ulcers are formed by an imbalance between protective mechanisms (e.g., cell proliferation and repair) of the gastric mucosa and potentially damaging gastric acid and pepsin secretions of the stomach. Gastric pathological imbalances may involve a number of substances, including proliferating cell nuclear antigen, substance P, and neurotensin. A total of 72 SD rats were randomly divided into a control group, a gastric ulcer model group, a true acupuncture (TA) group, and a sham acupuncture (SA) group, with 18 rats in each group. Next, each group was subdivided into 3 groups according to time points after completion of intervention (acupuncture or immobilization), with 6 rats in each subgroup. The rat model of gastric ulcer was established by intragastric administration of ethyl alcohol. The TA group received electroacupuncture at Zusanli (ST36) and Liangmen (ST21). The SA group received electroacupuncture at points 5 mm from Zusanli (ST36) and Liangmen (ST21). This is one type of acupuncture simulation used in research. Its limitation is that this type of sham control is active. The control and model groups received no acupuncture treatment during immobilization. The conclusions were obtained by comparing results of the four groups. The researchers note, “Acupuncture promotes cell proliferation and gastric emptying and inhibits gastric acid secretion by increasing PCNA, SP, and NT levels.” They add that “acupuncture can also inhibit inflammatory reactions induced by the overexpression of SP and eliminate abnormal hyperplasia risks due to increased PCNA and NT levels.” The conclusions indicate that acupuncture balances the levels of these substances to optimal levels. Microscopy is consistent with the biochemical findings. For the model group that did not receive acupuncture treatment, “severe epithelial damage was identified: mucosal cells were necrotic, detached, and sparse; glandular cells were disorderly arranged and swollen with blurred nucleus and cytoplasm; inflammatory cells infiltration, capillary proliferation, and hemorrhage were found in lesion site.” For the true acupuncture group, “mild epithelial damage was identified: mucosal and glandular cells were less necrotic, detached, sparse, and disorderly arranged; few inflammatory cells and red cells were observed; no obvious capillary proliferation was found.” The microscopic images confirm that acupuncture prevents tissue damage. The researchers selected acupoints ST36 and ST21 for their investigation based on ancient Traditional Chinese Medicine (TCM) principles. In TCM, gastric ulcers fall into the scope of Wei Wan Tong (stomach duct pain). Zusanli is the lower He-sea point of the stomach meridian. In the Ling Shu (Magic Pivot), it is written that “Lower He-sea points treat corresponding Fu organ diseases.” It is also written that “In stomach diseases, there should be abdominal distention, stomach duct pain…. Needling Zusanli is effective for the treatment of stomach diseases.” Liangmen is a local point on the stomach meridian. Needling this point combined with Zusanli regulates the spleen and stomach, supplements the center, and boosts qi. 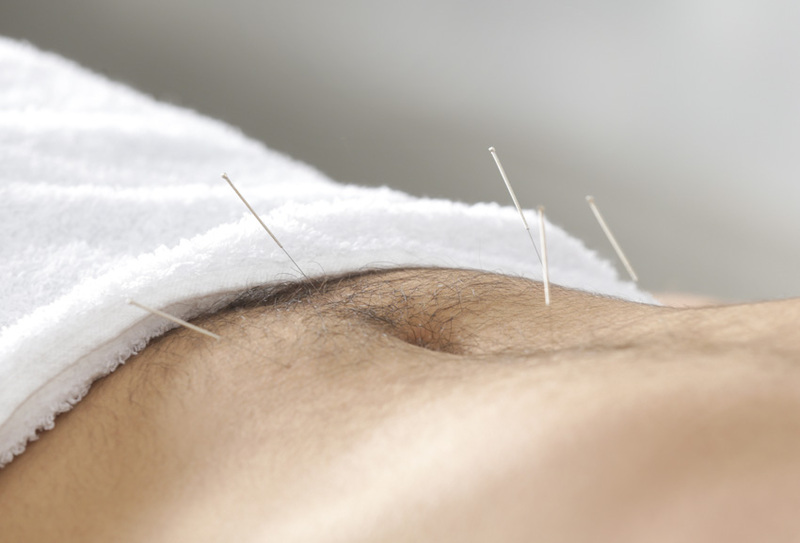 The hospital researchers compared acupuncture with a drug therapy protocol. In powerful findings, acupuncture produced superior clinical outcomes over drug therapy. Acupuncture outperformed drug therapy in symptom improvement and quantifiable microscopic results. In addition, Helicobacter pylori clearance rates were similar. Many acupuncturists are familiar with Chinese herbal medicine’s ability to achieve these results using herbal formulas containing herbs such as Hai Piao Xiao, Chuan Lian Zi, Huang Lian, Yan Hu Suo, Shi Di, Wu Zhu Yu, and Fo Shou Gan. This research demonstrates that acupuncture also produces important therapeutic benefits. Two groups were compared. In one group, acupuncture was administered. Needles were manually stimulated every 10 minutes during the 30-minute needle retention time. Acupuncture sessions were provided once per day. Patients received a consecutive 5-day treatment regimen plus a 2-day break each week. In the second group, patients received 20 mg omeprazole (once per day, administered in the morning), 500 mg amoxicillin (three times per day), 400 mg metronidazole (three times per day), and 100 mg of celecoxib (two times per day). That’s a stringent drug regimen; let’s break it down. Omeprazole is a proton pump inhibitor (PPI) used to treat excessive stomach acid. Amoxicillin and metronidazole are antibiotics used for the treatment of bacterial infections. Celecoxib is a nonsteroidal anti-inflammatory drug (NSAID) used to treat inflammation and relieve pain. For both groups, each treatment course consisted of 6 weeks of treatment. All patients received 2 treatment courses in total. Acupuncture had a 92.5% total symptom improvement rate, while drug therapy had a 77.4% total symptom improvement rate (P<0.05). Acupuncture had an 88.7% total improvement rate in microscopic results, while drug therapy had a 73.6% total improvement rate in microscopic results (P<0.05). Acupuncture had an 84.9% Helicobacter pylori (H. pylori) clearance rate and drug therapy had an 86.8% Helicobacter pylori clearance rate (P>0.05). The results of the aforementioned research indicate that acupuncture is an effective treatment modality for the treatment of gastric diseases. Researchers demonstrate that acupuncture alleviates relevant symptoms while simultaneously eliciting biochemical responses responsible for providing protective effects to the gastric mucosa. Zhang Y. Liu CC, Lian LY, Shen JC, He QD, Chen JL, Ma FQ, Yang ZB. Time-effect relationship and molecular mechanism of electroacupuncture for repair of gastric mucosal lesion [J]. Chinese Acupuncture and Moxibustion, 2018, 38(07): 747-752. Lanas A, Chan F. Peptic ulcer disease [J]. Lancet, 2017, 390(10094): 613-624. Guth PH, Aures D, Paulsen G. Topical aspirin plus HCl gastric lesions in the rat. Cytoprotective effect of prostaglandin, cimetidine, and probanthine [J]. Gastroenterology, 1979, 76(1):88-93. Strzalka W, Ziemienowicz A. Proliferating cell nuclear antigen (PCNA): a key factor in DNA replication and cell cycle regulation [J]. Ann Bot, 2011, 107(7): 1127-1140. Zhao Q, Wang CQ, Qiao JO et al. Hydrogen sulfide promotes neurogenic inflammatory response in mouse lung tissue via substance P [J]. Chinese journal of Clinical Medicine, 2015, 22(3): 262-267. Di FP, He Y, Koenig M, et al. The discovery of indole full agonists of the neurotensin receptor 1 (NTSR1) [J]. Bioorg Med Chem Lett, 2014, 24(16): 3974-3978. Zhang Y, Xue ZX, Hu W. Effect of acupuncture on chronic atrophic gastritis complicated with Helicobacter pylori infection​ [J]. Shaanxi Journal of Traditional Chinese Medicine, 2016, 37(08): 1078-1079.